Everybody has been there before. You walk into a networking event, industry professionals meeting, or social hour and don’t know anybody there. For some, it wouldn’t be much of a problem because it’s an adventure to meet new people and make connections, but that’s not the case for most. Networking can be awkward, uncomfortable, and downright intimidating. What’s a person to do? Whether you’re looking for a job or advancing your career, networking is an important tool. Building strong working relationships can help open doors to landing a job with a desired company or improve your trade by seeking advice from others for guidance and support. But, building a network from scratch can seem like an impossibility. You don’t have to be well connected to make connections. Everybody starts somewhere and you can have fun, meet people, and grow your network without knowing anyone in the room with these easy tips. With just about everything in life, it’s best to have a little strategy before going blindly into a strange place. You’re not strategizing military formations in a war, but you should be prepared if knowingly going somewhere unfamiliar. Before going, catch up on the latest industry, community, and national news. Being caught up on the latest headlines and having an opinion on it can help you start conversations with others and demonstrates your passion and expertise in your field. If you’re attending an event, find out who is going to be there, learn about them, and think of a question or two to ask them. When in doubt, people love talking about themselves, so try to have a few open-ended questions just in case. Depending on your personality, you should find people you think you would fit in with. A more open, outgoing person might target those who are getting the most attention or the biggest crowd. That’s probably where the most interesting conversation is and your chance to shine. For the more introverted person, look for people who are by themselves or in smaller groups. They may not be very outgoing and are likely feeling the same pressure you are, but that doesn’t mean they aren’t a potential resource of information and leads. 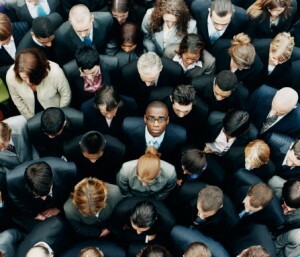 Many people feel like walking into a circle of people at a social outing is unwelcome. They feel like they are intruding on a conversation that they weren’t invited to. It’s generally acceptable to walk into a conversation at a social event. The more outgoing people don’t see it as an intrusion, but an inclusion into the conversation. If you’re unsure about joining a group of people, walk closely to the group. Casually observe the conversation and get the attention of someone in the group. Once you make eye contact, send a nonverbal greeting their way and wait for a response. If you get one back, introduce yourself and join the conversation. You may feel out of your element when talking to a group of strangers, but that doesn’t mean you should stop being yourself. Don’t worry about acting the way others expect you to – be yourself. Always be courteous, respectful, and mindful of etiquette, but don’t accept invitations or participate in anything that feels out of character. Many can see through it and it can hurt your relations in the long run. Meeting people and building relationships at an event will be much more effective if you keep up with them after your first meeting. Following up with those you meet demonstrates your reliability and interest in your new contact. It doesn’t have to be anything in-depth or boring. It could be something as simple as sending a funny or interesting link related to your conversation, asking how things went after a particular event they were preparing for, or scheduling time to meet for lunch to discuss something if your contact offered to help you with a job search or career development. Everyone is a stranger until you meet them. Once you get past the fears and be yourself, you’d be surprised how many wonderful people you can meet and relationships you can build when stepping a bit out of your comfort zone and enjoying yourself. Let us know some of your best networking stories in the comments below. Every month, Movin’ On Up recognizes Express Employment Professionals’ associates who have been recommended by one of our offices as outstanding workers, and we want to give credit where credit is due. Express employed more than 335,000 workers in the United States and Canada in 2011, and each one of them has a story to tell. Express takes pride in the accomplishments of those individuals who come to us for work. Without the skills and talents our associates provide to employers, Express wouldn’t be what it is today. Our newest associate spotlight is a great example of the kind of spirit and effectiveness Express Employment Professionals demonstrates with everyone we work with. In this month’s associate spotlight, a certain associate’s professionalism and willingness to go above and beyond the call of duty has not only earned the respect and admiration of her employer, but her local Express office as well. 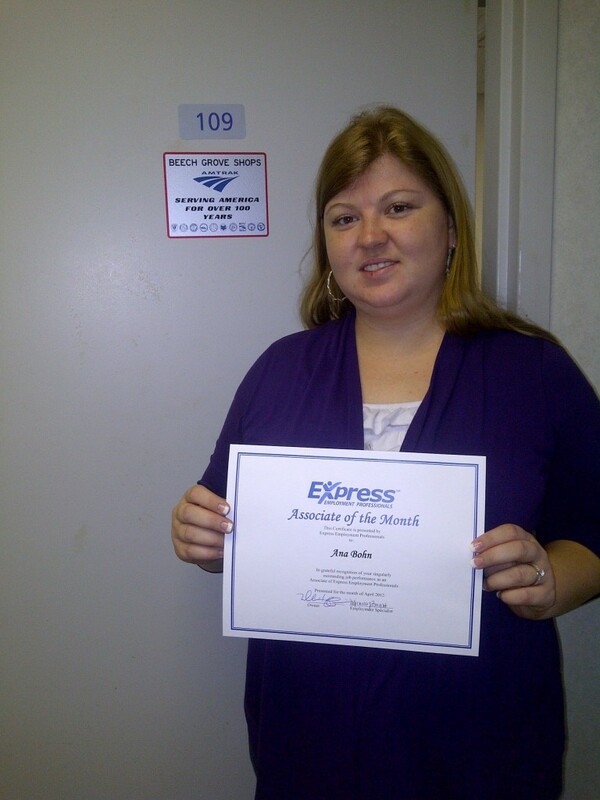 Ana Bohn came to the South Indianapolis, IN, Express office a year ago and was assigned to work in the Amtrak Claim Office. Working at Amtrak has been a wonderful experience for Ana as well as Amtrak. Since starting, Ana’s dedication, professionalism, and willingness to learn has helped her consistently prove that she was up to the task, which earned more and more responsibilities in her role as an Administrative Assistant. When workloads have gotten unmanageable, Amtrak has become increasingly reliant on Ana for her support and always coming through. Specifically, Ana has demonstrated a strong work ethic and is very willing to learn new programs or processes that support the office. “Ana has adjusted to the ‘Amtrak way’ and has a good working relationship with others outside of the department who we depend upon for information. She is the epitome of a professional in every sense of the word,” said Parrish Gross, Ana’s direct supervisor. We love hearing stories about the determination and quality work Express associates demonstrate every day. Ana is just one example of thousands of Express associates who achieve success through their strong talent and resolve. 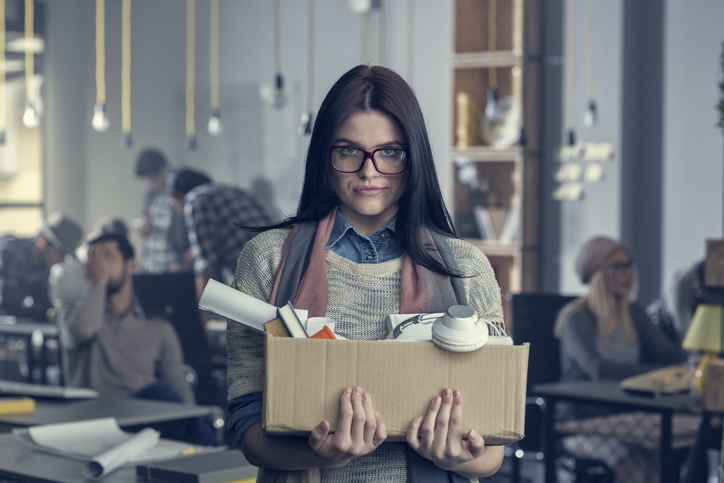 If you’re searching for a job, consider working with a staffing agency like Express. 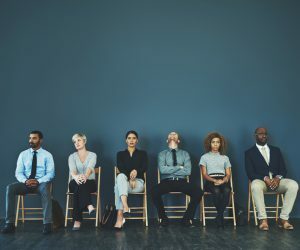 More and more employers are relying heavily on staffing companies to fill open positions before hiring them on as full-time employees. If you’re an Express associate and know a fellow associate who would be a great candidate for our associate spotlight, let your Express office know. If you have an Express associate you’d like to feature on Movin’ On Up, let us know in the comments below.